Fisher Price “My First Books” Set of 4 Board Books. Children and toddlers engage with Fisher Price characters as they learn the ABCs, colors, counting and opposites! Set of 4 colorfully illustrated Fisher Price books for babies and toddlers: My Alphabet Book, My Colors Book, My Opposites Book and My Counting Book. Perfect books to teach toddlers basic reading and counting skills — all taught by adorable Fisher Price characters. Fisher Price board books for toddlers are approximately 12 pages each and measure 4 x 4 inches. Their small size makes them perfect for your little one to hold and read. These easy to read, richly illustrated books will introduce young children to the joys of books and reading! Manufactured excluvisely for Crenstone.Fisher Price “My First Books” Set of 4 Board Books. Children and toddlers engage with Fisher Price characters as they learn the ABCs, colors, counting and opposites! 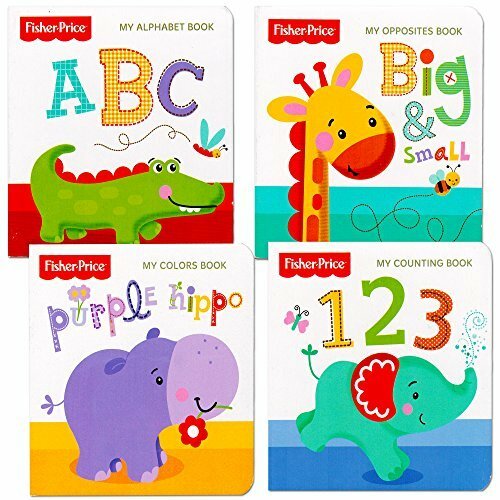 Set of 4 colorfully illustrated Fisher Price books for babies and toddlers: My Alphabet Book, My Colors Book, My Opposites Book and My Counting Book. Perfect books to teach toddlers basic reading and counting skills — all taught by adorable Fisher Price characters. Fisher Price board books for toddlers are approximately 12 pages each and measure 4 x 4 inches. Their small size makes them perfect for your little one to hold and read. These easy to read, richly illustrated books will introduce young children to the joys of books and reading! Manufactured excluvisely for Crenstone.